Kim Dae-jung, (January 6, 1924 - August 18, 2009) pronounced [kim dɛdʑuŋ] was the 8th South Korean president and the 2000 Nobel Peace Prize recipient. After being born to a rural family in a region of Korea with relatively little political influence, Kim Dae-jung entered politics when he was about thirty, and after many setbacks, was elected president more than four decades later, in 1997. Kim Dae-jung was inaugurated as President of South Korea in 1998, succeeding Kim Young-sam, and served one term of five years, the term limit according to the South Korean constitution. Kim's administration has been credited with a number of economic reforms that helped the country to recover from the severe financial difficulties that faced Korea when his term began. He is also known for establishing a Sunshine policy with North Korea, making a substantial step toward reunification of Korea, one manifestation of which was the presidential summit with Kim Jong Il and Kim Dae-jung in 2000. While these accomplishments prove his worth as an able leader, accomplishing substantial benefits for the prosperity and stability of his people, other aspects of his administration, broken promises and instances of bribery, show that he did not possess all the elements of in ideal political leader. Kim Dae-jung was born to a family of middle-class farmers in a farming community on Hauido Island in South Jeolla province in southwestern Korea, the second of seven children. His family moved to Mokpo, a port city on the mainland, where he graduated from high school at the top of his class in 1943. Eventually, he attended Kyunghee University in Seoul, receiving a master's degree in economics. Before entering college he went to work for a cargo shipping company. He proved to be a good study and after a few years started his own company, owning nine small freighters. In 1950, he became president of a Mokpo daily newspaper. When the Korean War broke out in June of that same year, he was in Seoul. In the upheaval caused by the conflict, it took him 15 days to walk back home to Mokpo where he was arrested by North Korean forces and later released. Kim's first wife died in 1959. He married Lee Hee-ho in 1962. He had three sons, two from his first marriage and one from his second. The concluding years of Kim's presidency were clouded by the corruption scandals involving his second and third sons, and their subsequent convictions. The events were particularly embarrassing to the president because he was elected promising to make the fight against corruption one of his top priorities. Kim died on August 18, 2009 in Seoul. An interfaith state funeral was held for him on August 23, 2009 in front of the National Assembly Building, with a procession leading to the Seoul National Cemetery where he was interred according to Catholic traditions. He is the second person in South Korean history to be given a state funeral after Park Chung-hee. North Korea sent a delegation to his funeral. Kim first entered politics in 1954 during the administration of Korea's first president, Syngman Rhee. He made three unsuccessful attempts to get elected to the National Assembly. Although he was elected as a representative for the National Assembly in 1961, a military coup led by Park Chung-hee, who later assumed dictator powers, voided the elections. Kim was one of many political activists who were arrested at the time. He was released in 1963, and when the democratic political process was restored to some degree, he won a clear victory and gained an Assembly seat as a representative of Mokpo. He was also able to win a seat in the House in the subsequent elections in 1967 and went on to become an eminent opposition leader, which culminated in mounting a presidential campaign in 1971 as a candidate of the Democratic Party, running against the incumbent Park Chung-hee. He managed a close race against Park despite several handicaps imposed by the ruling regime. He proved to be a supremely talented orator who could command unwavering loyalty among his supporters. His staunchest support came from the Jeolla region, where he reliably garnered upwards of 95 percent of the popular vote, a record that has remained unsurpassed in South Korean politics. One of seven candidates in the elections, Kim received 46 percent of the vote. There were allegations that Park rigged the elections; in the end, Kim lost to Park by a margin of just 970,000 votes. The exposure to publicity established Kim as a permanent fixture in Korean politics for decades to come. Although he had beaten Kim in the election, Park saw Kim, a strong advocate for civilian democracy, as a threat to his strongly military administration. Following the election, an assassination attempt staged as a car accident was attempted on Kim, leaving him with a permanently injured hip joint. On October 24, 2007, following an internal inquiry, South Korea's National Intelligence Service (NIS) admitted that its precursor, the Korean Central Intelligence Agency KCIA, undertook the kidnapping, saying it had at least tacit backing from Park. Kim fled to Japan and began an exile movement for democracy in South Korea based in Japan and the United States. He was in Japan when President Park declared martial law in 1972 and formulated his yushin. He was almost killed in August 1973, when he was kidnapped from the Hotel Grand Palace in Tokyo by KCIA agents in response to his criticism of the Yushin program. He had been attending a meeting with the leader of the Democratic Unification Party held in Room 2212. He was abducted by a group of unidentified men as he walked out of the room after the meeting. He was then taken into empty Room 2210 where he was drugged and became unconscious. He was moved to Osaka and later to Seoul. Kim was later quoted as saying that a weight had been attached to his feet aboard the boat heading toward Korea, indicating that the kidnappers had intended to drown him by throwing him into the sea. They were, however, forced to abandon this plan as the Japan Maritime Self-Defense Force began a pursuit of the kidnappers' boat. Subsequently Kim was released in Busan. He was found alive at his house in Seoul five days after the kidnapping. According to some reports U.S. Ambassador Philip Habib intervened with the South Korean government to save Kim's life. Although Kim survived, he was banned from politics. In March 1976, Kim and a number of other public figures issued a manifesto calling upon President Park to restore democracy and resign. As a consequence he was arrested and sentenced to eight years in prison. In December 1978, after serving about 33 months, his sentence was commuted to house arrest due to his poor health. Kim reentered politics in 1979 after Park Chung-hee was assassinated. However in 1980, Kim was arrested and sentenced to death on charges of sedition and conspiracy in the wake of another coup by Chun Doo-hwan and a popular uprising in Gwangju, his political stronghold. In May, violent anti-government demonstrations broke out in the city, and Kim was accused of mass agitation. The demonstrations turned into a rebellion and government troops moved in to restore order, killing several hundreds of people, according to some counts. President Chun was slated to meet with President Ronald Reagan, and in response to requests from the United States government, the sentence was commuted to 20 years in prison. In December 1982, he was released under the agreement that he leave Korea. He found political refuge in U.S., temporarily settled in Boston, Massachusetts, and taught at Harvard University as a visiting professor to the Center for International Affairs. During his period abroad, he authored a number of opinion pieces in leading Western newspapers that were sharply critical of his government. In 1985, he decided to return to Korea. Kim was again put under house arrest upon his return to Seoul, but resumed his role as one of the principal leaders of the political opposition. When Chun Doo-hwan succumbed to popular demand in 1987 and allowed the first democratic presidential election since the 1972 coup, Kim Dae-jung and Kim Young-sam both ran. The result was a split the opposition vote, with Kim Young-sam receiving 28 percent and Kim Dae-jung 27 percent of the vote. The ex-general Roh Tae-woo—Chun Doo-hwan's hand-picked successor—won easily with 36.5 percent of the popular vote. He made yet another failed bid for the presidency in 1992, this time solely against Kim Young-sam, who won as a candidate for the ruling party. Many thought his political career was effectively over when Kim took a hiatus from politics and departed for the United Kingdom to take a position at Clare Hall, Cambridge University as a visiting scholar. However, in 1995 he announced his return to politics and began his fourth quest for the presidency. The situation became favorable for him when the public revolted against the incumbent government in the wake of the nation's economic collapse in the Asian financial crisis just weeks before the presidential election. Allied with Kim Jong-pil, he defeated Lee Hoi-chang, Kim Young-sam's successor, in the election held on December 18, 1997, and was inaugurated as the fifteenth President of South Korea on February 25, 1998. The election was marred with controversy, as two candidates from the ruling party split the conservative vote (38.7 percent and 19.2 percent respectively), enabling Kim to win with a 40.3 percent of the popular vote. Kim's chief opponent, Lee Hoi Chang, was a former Supreme Court Justice and had graduated at the top of his class from Seoul National University College of Law. Lee was viewed by some as a holdover of past conservative policies and his candidacy was marred by charges that his sons dodged mandatory military service. Kim was criticized by some because his education was limited to vocational high school. A good number of Koreans sympathized with the trials Kim had previously endured, and his new approach appealed particularly to younger members of the electorate. The preceding presidents Park Chung Hee, Chun Doo-hwan, Roh Tae-woo, and Kim Young-sam all came from the relatively wealthy Gyeongsang region. Kim Dae-jung was the first president to serve out his full term who came from the Jeolla region in the southwest, an area that traditionally has been neglected and less developed, at least partly because of discriminatory policies of previous presidents. Kim's administration was in turn overrepresented in individuals from the Jeolla province, leading to charges of reverse discrimination. Kim's inauguration marked the first time in Korean history that the ruling party peacefully transferred power to a democratically elected opposition victor. Greeting United States President Bill Clinton (left) at APEC meeting in Auckland, September 12, 1999. 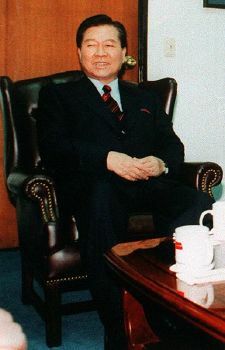 Kim Dae-jung took office in the midst of the economic crisis that hit South Korea in the final year of Kim Young-sam's term. He vigorously pushed economic reform and restructuring recommended by the International Monetary Fund, in the process significantly altering the landscape of South Korean economy. In effect, his policies were to make for a fairer market by holding the powerful chaebol (conglomerates) accountable, e.g., greater transparency in accounting practices. State subsidies to large corporations were dramatically cut or dropped. His administration is credited by some with overseeing a recovery from the Asian Financial Crisis although many believe that a recovery was inevitable and he actually hampered a full recovery. "I know that the first South-North Korean summit meeting in June and the start of the inter-Korean reconciliation is one of the reasons for which I am given the Nobel Peace Prize. (...) First, we agreed that [national] unification must be achieved independently and peacefully, that unification should not be hurried along and for now the two sides should work together to expand peaceful exchanges and cooperation and build peaceful coexistence. Second, we succeeded in bridging the unification formulas of the two sides, which had remained widely divergent. By proposing a 'loose form of federation' at this time, North Korea has come closer to our call for a confederation of 'one people, two systems, two independent governments' as the pre-unification stage. For the first time in the half-century division, the two sides have found a point of convergence on which the process toward unification can be drawn out." It was later determined that the North-South summit occurred only after the South Korean government paid $500 million to Kim Jong Il. In addition, the North Korean leader never kept his promise to reciprocate by visiting South Korea. North Korea has not reduced the heavy presence of troops in the DMZ and has continued to work on developing nuclear weapons, which it tested in October 2006. During Kim's administration, North Korean naval vessels intruded into South Korean waters and fired upon a South Korean naval vessel without warning, killing and wounding South Korean sailors. Kim was criticized for not demanding an apology from North Korea and going to Japan to attend a World Cup soccer match in the wake of the gunbattle between the two Koreas. Under past governments, Kim's left-leaning policies had led to accusations that he was a "communist," a grave offense under the South Korean National Security Law, which prohibits fraternizing with the Marxist northern enemy. 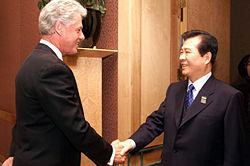 Kim completed his five-year presidential term in 2003 and was succeeded by Roh Moo-hyun. Kim actively called for restraint against the North Koreans for detonating a nuclear weapon and defended the continued Sunshine policy towards Pyongyang to defuse the crisis. He promised that he would take active responsibility if North Koreans ever tried to arm themselves with nuclear weapons, but there has been considerable debate about whether the Sunshine Policy facilitated Pyongyang's nuclear programs. He received an honorary doctorate at the University of Portland on April 17, 2008, where he delivered a speech entitled, "Challenge, Response, and God." A presidential library at Yonsei University was built to preserve Kim's legacy, and there is a convention center named after him in the city of Gwangju, the Kim Dae-jung Convention Center. ↑ There are conflicting records of Kim Dae-jung's date of birth, ranging from 1923 to 1926. It is reported that his birth was first recorded as January 6, 1924, and that the record at the Mokpo Courthouse was later amended to show the date of birth as December 3, 1925, the date amended to avoid conscription during the time when Korea was under Japanese colonial rule According to media reports, the former president marked his birthday each year on January 6, and the commemoration in 2008 was described as his 84th birthday; hence current usage would put his date of birth at January 6, 1924. ↑ Kim Dae-jung, Nobel Lecture Oslo, December 10, 2000. Retrieved January 27, 2016. This page was last modified on 17 April 2018, at 14:28.